I am really liking that color. My 3 favorite Jeep colors are this hydro blue, the true blue pearl from 2013 and the new JL ocean blue metallic. Baby Blue got a new stinger and Headlight last night. 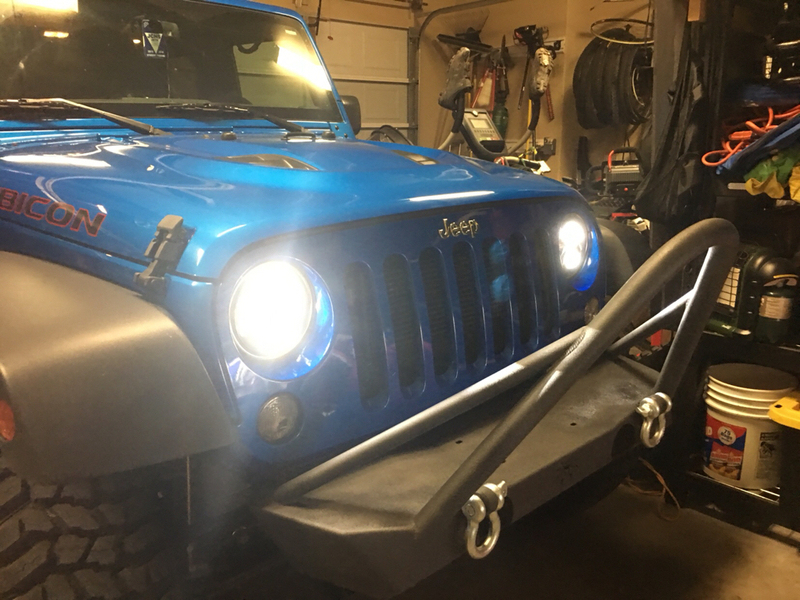 Poison Spyder Brawler lite stinger bumper and ProComp LED headlights. ProComps are, IMO, the best bang for the buck headlight available. If you are still using stock lights you really need to check these out. You can find them for under $270 a pair. Yea, the AEV tire carrier also works. So does the Smittybilt XRC Gen II. So we bought 2. Should be able to get to that install at the end of Sept due to multiple work trips getting in the way. My son also picked up a pair of the ProComp HID 7” round lights super cheap at the 4WP Jeep show in ATL. Those will be going up on the windshield later as well. Gotta love a well-proportioned two-door! Nice!!! Love the blue and looks great.